"To [Thoreau] there was no such thing as size. The pond was a small ocean; the Atlantic, a large Walden Pond. He referred every minute fact to cosmical laws." Visit Walden Pond State Reservation. Explore Freedom's Way National Heritage Area. Learn more at the Thoreau Society, present at the Pond since 1941. "R.W.E. 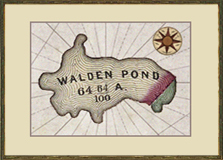 told of Mr. Hill, his classmate, of Bangor, who was much interested in my "Walden," but relished it merely as a capital satire and joke, and even thought that the survey and map of the pond were not real, but a caricature of the Coast Survey." — H.D. Thoreau, Journal, January 5, 1855. Thoreau began the first of his seven drafts of Walden during the latter half of his sojourn at the pond from 1845-1847. 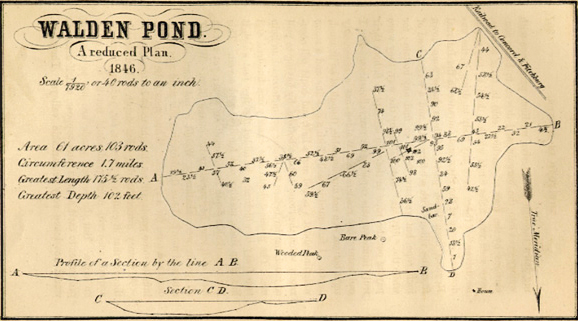 During this period, he made a survey of the pond that was included when the book was published in 1854, but frequently omitted from editions published after his death. 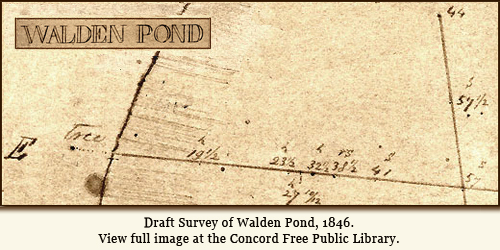 Thoreau's 1846 survey did not elicit much commentary among the readers of Walden. However, Theodore Parker, an abolitionist minister and frequent lyceum speaker, expressed his disdain for Transcendentalism by reportedly characterizing the Walden map as "the only useful thing Thoreau had ever done." The London Review was much more respectful: "Of what Thoreau might have done had his life been prolonged, or of the value of his day's work whilst among us, we do not propose to speak. He managed to live honestly for nearly five and forty years, and if that be not sufficient, let it be remembered that he left behind him an accurate survey of Walden Pond. What other surveys he made, what other depths he sounded, will be confessed by kindred souls."